RNA can be isolated from many different types of cells from eukaryotic and prokaryotic origin, including animals, plants, and bacteria. Depending on the source and the type of sample (organ tissue, cultured cells), appropriate procedures must be applied for RNA extraction to 1) maintain the integrity of the RNA, 2) inhibit RNA degradation because of RNases, and 3) obtain clean RNA preparations by removing protein and DNA contaminations. Because RNA extraction can be quite a lengthy procedure and, furthermore, in many cases, numerous samples have to be analyzed in parallel, it is necessary to store the isolated RNA. Again, storage conditions should be selected to preserve the RNA in such a way that storage does not modify the RNA in any way. However, the intended use of the stored RNA also determines the way how the RNA is to be stored. In this article, an overview of currently used techniques to obtain RNA from various sources and a description of the factors to consider for RNA storage are presented. The isolation of intact, clean RNA is crucial for downstream experiments such as reverse transcription of RNA for cDNA cloning, RNA fingerprinting and secondary structure analysis, as well as for functional studies involving RNA metabolism. RNA stabilization is an absolute prerequisite for reliable gene-expression analysis. Stabilization of RNA in biological materials immediately after harvesting the sample is necessary because changes in the gene-expression pattern occur because of specific and nonspecific RNA degradation as well as to transcriptional induction. Even a single nick can render the RNA molecule nonfunctional. This has to be considered when gene expression is studied by performing in vitro transcription and translation experiments, or transfection of infectious, self-replicating viral RNA. Whereas double-stranded RNA is relatively resistant against most RNases, particular care must be used when handling single-stranded RNA. The most important factor determining the quality of the RNA to be studied is the ubiquitous presence of RNases. This is a group of RNA-degrading enzymes, each acting in a sequence-specific way on double- or single-stranded RNA. Furthermore, some RNases such as RNase A are extremely resistant to inactivation by heat. For this reason, a suitable method for RNA extraction must be chosen which allows instant inactivation of RNases. This is achieved by dissolving proteins in denaturing agents such as guanidinium thiocyanate, phenol, or beta-mercaptoethanol. To avoid or minimize ribonuclease contamination problems, all materials used for working with RNA should be RNase-free. Water should be treated with diethylpyrocarbonate (DEPC) that inactivates nucleases or should be obtained by ultrafiltration through a high-efficiency organics removal system. Glassware must be baked at least for 4 hr at 180°C because autoclaving does not inactivate ribonucleases completely. 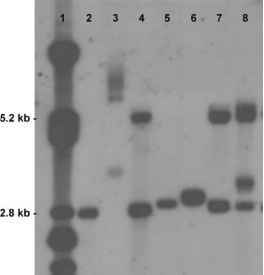 Plasticware straight out of the package can generally be considered free from nuclease contamination and can be used without any pretreatment. However, reused plasticware such as electrophoresis tanks should be filled with 3% H2O2 solution for 10 min at room temperature, followed by thorough rinsing with RNase-free water. Because hands are a major source of RNase contamination, gloves must be worn and changed frequently. It is also a good idea to keep separate stocks of chemicals that are exclusively used for RNA work and are removed from the bottle only with RNase-free tools (e.g., baked spatula). Several types of specific RNase inhibitors can be used. 1) Protein inhibitors of RNases, either isolated from human placenta or produced synthetically as a recombinant protein, can be added to the extracted RNA. Furthermore, because these RNase inhibitors generally do not interfere with reverse transcriptases and polymerases, they are frequently used to prevent RNA degradation during subsequent reactions such as reverse transcription. 2) Vanadyl-ribonucleoside complexes (VRC) bind to many RNases thereby inhibiting their activity. VRC can be added to the intact cells or tissue before lysis and remain in the RNA-containing fraction during all stages of RNA extraction and purification. However, VRC can only be used for certain in vitro enzymatic reactions (e.g., reverse transcription), whereas they interfere with others such as cell-free in vitro translation of mRNA. Numerous commercial products for RNA extraction are available today. Most of them are either based on a combination of guanidinium isothiocyanate and phenol based on a single-step RNA isolation method originally described by Chomczynski and Sacchi followed by RNA precipitation, or by binding of RNA in guanidinium-lysed samples to a silica-gel membrane from which the RNA is subsequently eluted after washing. These methods allow disruption of the cells and simultaneously inactivate ribonucleases.